Tractor Supply Company’s Stewardship Program was born out of our commitment to doing the right thing for our company, our customers and our communities. Fulfilling that commitment requires constant analysis and evolution to ensure that we are living and operating as sustainably as possible, at every level within the Company. In the last 10 years, developments to make equipment and technology more efficient, sustainable and cost-effective have progressed at a rapid pace, creating new opportunities for Tractor Supply to further our Stewardship goals, particularly at the store level. However, these developments have also meant pursuing massive projects that require the cooperation and assistance of thousands of team members across the Company. Fortunately, that has never been cause for Tractor Supply to back away from a project. 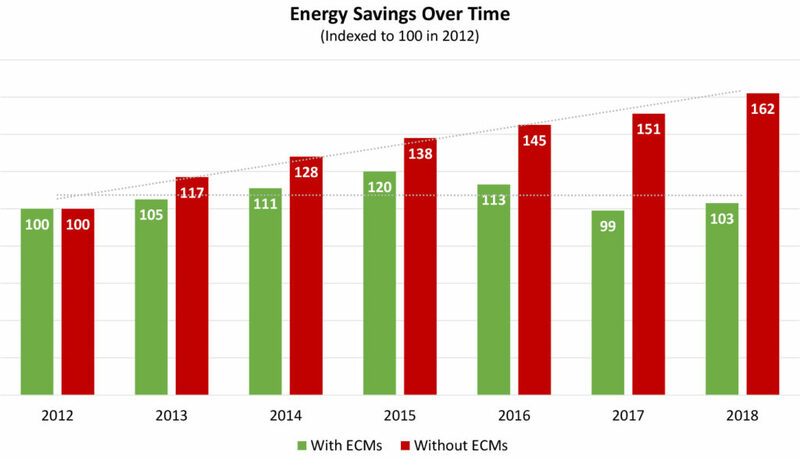 Without energy conservation measures (ECMs) adopted in 2012, Tractor Supply would have consumed approximately 60% more energy last year, as seen in this chart. 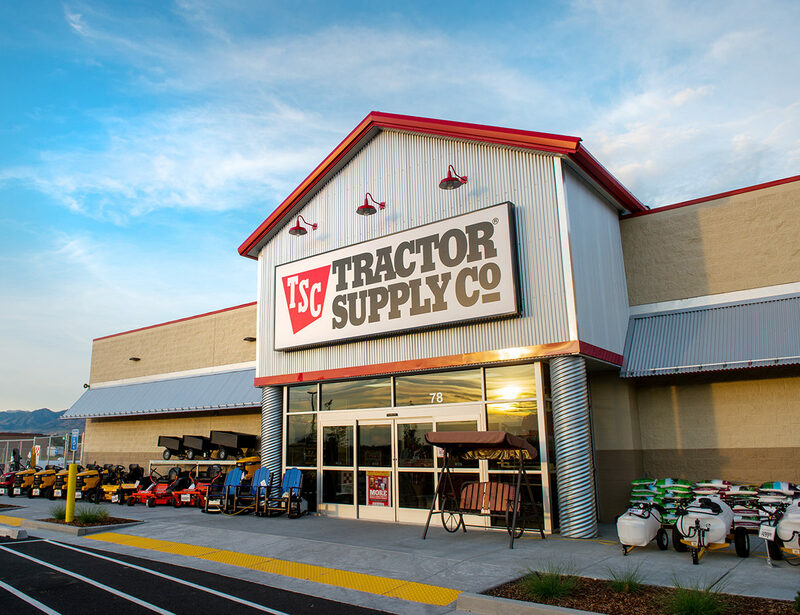 Since 2010, Tractor Supply has implemented multiple projects that have transformed every TSC store into a sustainable outpost, making a significant impact on the environment and our company’s bottom line. The largest undertaking thus far has been a LED lighting project that began in 2014. Before delving into this companywide transformation, TSC conducted a year-long test at two store locations that were outfitted with exterior LED lights, while also doing a study at two other stores to evaluate the difference in energy usage between interior LED and fluorescent lights. 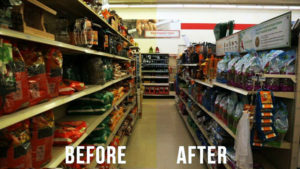 Ultimately, the LED lights were more efficient, more reliable, brighter and improved the look and feel of the stores. Even better, they cut energy usage in half, improving our ability to operate sustainably while reducing electricity and leading to a reduction in cooling needs and expenses for TSC. As seen in this photo, LED lights, compared with florescent lights, made the stores brighter, improving the look and feel of the stores while reducing energy consumption. Armed with this information, in 2016, TSC launched a chainwide initiative to convert all interior and exterior lights to LED. The success of this program required the cooperation of nearly every team member across the country, and it was completed without a hitch. By 2018, over 1,440 Tractor Supply stores had converted to LED lighting, with all new stores being similarly outfitted. The LED program has been a win-win for the Company because it accomplishes our goal of positively impacting the environment while improving our bottom line. That same goal has motivated the conversion of in-store HVAC units to newer, more efficient models that have high SEER (seasonal energy efficiency ratio), reducing costs and electricity and gas consumption, as well as the need for repairs. Because of the Company’s plans to replace a large number of units, the Company implemented a phased roll-out, replacing the oldest and least efficient units first. That win-win philosophy also drives our energy purchasing program, which now includes a considerable amount of renewable energy in its portfolio. For years, purchasing renewable energy, such as solar, wind or biomass, didn’t make financial sense. But advances in technology have shifted that opportunity, allowing Tractor Supply to contract with suppliers in deregulated markets to ensure a certain percentage of renewable energy exists within the annual volume purchased by the Company. These Stewardship initiatives have helped the Company gain tremendous ground in our sustainability efforts, but the results are often only understood through data and reporting. Our cardboard recycling program, though, is a different story. This initiative has been one of the most popular and successful, engaging team members, increasing productivity and decreasing our environmental impact. It is an unfortunate reality that, in retail, we generate a lot of cardboard waste. Breaking down boxes is time-consuming and cumbersome, and all that cardboard negatively impacts the environment. In 2010, TSC launched a baler program for existing stores. Based on the success of the program in the distribution centers, 50 stores were outfitted with cardboard balers to compress and palletize the cardboard, streamlining the disposal process and making for easy pick-up from our cardboard recycling vendor. Balers were then rolled out to all stores, with the retrofit program being completed in 2013. The balers increase team member efficiency, while the recycling program keeps tons of cardboard out of landfills and saves energy, trees and water needed to manufacture new cardboard. Last year, TSC recycled 25,586 tons of cardboard. As a result of the baler retrofit, TSC was able to recycle 25,586 tons of cardboard in 2018. 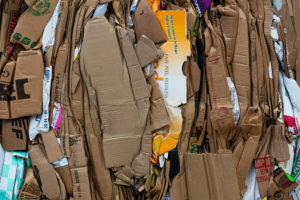 The very real impact that team members experience while recycling cardboard is also felt through the Energy Management System (EMS), which is currently in 1,740 stores. The EMS controls lighting, heating and cooling remotely to optimize energy usage and comfort. It places stores on a schedule to address specific circumstances while also performing diagnostic testing. The EMS provides visibility into planning, organizing and controlling budgets, and the EMS can make a widespread adjustment so that stores are more resourceful and conserve energy during the store’s occupied hours. Ultimately, the EMS takes the onus of regulating temperature away from team members while also eliminating the impact that user error can have on energy costs. The sustainability of our stores is an ongoing journey that will continue as technology evolves. It’s easy to make new plans for stores that have yet to be built, but modifying existing stores to embrace change is a challenge that we will continue to confront. But so long as it helps us achieve our Stewardship goals, we stand ready to forge ahead, working relentlessly to fulfill our commitment to future generations. As part of our sustainability conversion, team members have been educated on the importance of keeping doors closed. Each time a door is opened, the internal air is released, wasting energy and driving costs. This video uses thermal imaging to illustrate the amount of heat that escapes each time a door is opened.